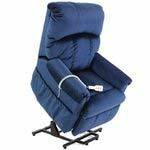 For those who have difficulty standing from a sitting position and tend to flop down into a seat when sitting, a seat lift chair will make life much easier. Electrically operated, the seat of a seat lift chair rises and tilts forward to make accessing and leaving the chair easier. To sit, a user stands in front of the chair when the seat is in the raised position, leans back against the seat and activates the switch which will lower the user down into an upright sitting position. When the user wishes to stand, they activate the switch and the seat lifts the user to a standing position. The pictured model is available in 4 different colours and has a weight capacity of 300 lbs. Two position lift chairs are designed to provide the same benefits as the seat lift chair but do it a little differently. Instead of only the seat lifting as in a seat lift chair, the entire chair lifts and tilts forward on a 2 position lift chair. When this model of chair is lowered, the user has the option of lowering themselves to a normal sitting position or, if they continue to hold the lowering button, their feet will be elevated. When the chair travel has reached it's end, the user will be sitting more or less upright position with their feet out straight ahead of, and level with, their hips. The model pictured offers 39 combination of colours and fabrics, the option of heat and massage in the seat and will accommodate a user of up to 300 lbs. 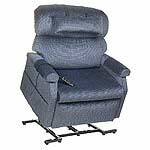 Three Position lift chairs are simply a step up from a 2 position lift chair. The controls work basically the same but, when the travel of a three position lift chair reaches it's lower maximum, the user's knees and feet are higher than their hips and the back of the chair is reclined. Many people who have trouble sleeping while lying flat in a bed will choose this model of lift chair to sleep in at night. These chairs are well padded and very comfortable. The pictured model of 3 position lift chair is available in 28 colour and fabric options, the option of heat and massage in the seat and back. 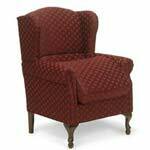 This model is available in four different sizes with the smallest having a 375 lb. weight capacity and the largest having a weight capacity of 700 lbs. The infinite position lift chair is an upgrade from the 3 position lift chair which reclines to almost a flat position for sleeping. This would be of benefit to people who could sleep in a flat bed but for some reason aren't able to transfer into a flat bed or need to be able to changes their position through the night. The pictured model is available in 36 colours and fabrics and heat and massage available in the seat and back or the seat only. Available in two different sizes the weight capacity of 375 lbs. applies to both sizes. This heavy duty lift chair has an infinite position range and is available in 31 colours and fabrics. With a seat width of 33" between the arms and a 700 lb. 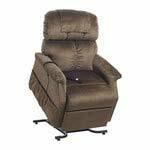 weight capacity there is no other lift chair on the market in a bigger size or higher weight capacity. This heavy duty chair is operated by three individually operated motors to control the seat and the back separately which allows the user to fine tune the chair to the most comfortable position possible. The cushions are high-density foam for durability, and the seat cushion is reversible.